Capoeira is not just a sport; it is an art form, a culture and an educational activity. It is used as a tool to educate. In many Brazilian schools and projects, capoeira develops its students. Not only in the physical, but also in an intellectual, philosophical and moral sense. Capoeira is an art form that trains the practitioner to utilize the entire body’s musculature. It trains the body in all three planes of movement (forwards, sideways, and twisting); utilizing the body’s own weight while standing. In time, the capoeirista learns to perform all three planes of movement (with control) while standing on their hands while learning to switch on and control the core muscles (abdominals), in order to control one’s balance and stability. Why should you learn Capoeira? Students are always moving around on their hands in handstands, rolls, arm balances, etc. that can make drastic improvements on upper body strength. Students also perform many types of kicks and movements that are guaranteed to improve leg strength. Some students are on par with yoga practitioners in terms of their flexibility. Lengthy and motivated Capoeira games can consume enormous amounts of energy. This, combined with constant repetition of movements and techniques, makes Capoeira a valuable cardio exercise. Capoeira will improve your strength, flexibility, and stamina, thus improving your overall fitness. 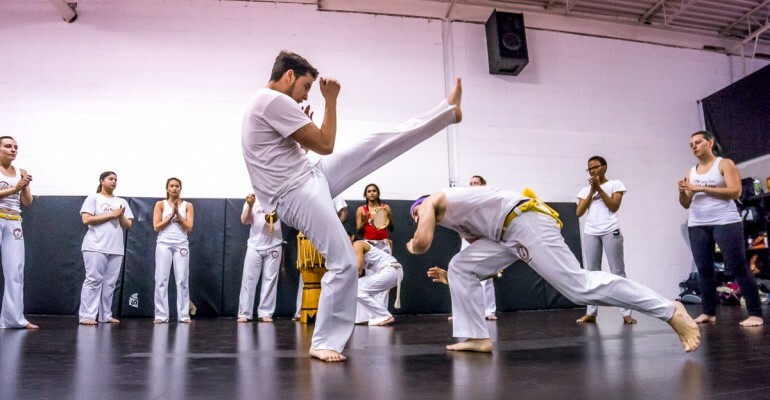 It may take a while to get used to the drills, movements, and games, but once you begin to embrace Capoeira as a regular routine you will become the picture of health. When you join Kadara Capoeira, you become part of a family. You will meet people from all walks of life, and you will make new friends in your journey from all around the world. You may not become fluent (athough that’s always a possibility), but there is no doubt that you will come to understand and perhaps speak a bit of Brazilian Portuguese. Capoeira is deeply connected to Brazil and Africa. You will learn about significant historical events of the world and empathize with the art and culture of Brazil and its roots. If nothing else, Capoeira is perfect for instilling a sense of pride and confidence in anyone who joins Kadara Capoeira. Not only will you feel stronger both physically and mentally, you’ll find confidence in knowing that you are part of a global family of Capoeiristas and have full knowledge and capability in yourself!